This might be a little off topic but I decided to share this story because I read a lot of stories that helped me during my Molar Pregnancy. 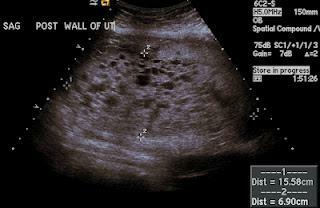 "A molar pregnancy happens when tissue that normally becomes a fetusinstead becomes an abnormal growth in your uterus. Even though it isn't an embryo, this growth triggers symptoms of pregnancy. "Ricardo and I were so excited to be expecting a child just 1 month after trying. I was so excited that I tried my best to look past the extreme nausea, fatigue,dizziness and food aversions. I missed quite a few days of work because I was so tired and I felt terrible because I was unable to give Zahara the attention she needed. I just kept telling myself that everything would get better in the 2nd trimester. I told Ricardo that I thought maybe we were having twins because all of my symptoms were so extreme and although I hadn't gained much weight I was already showing at around 9-10 weeks. At 11 weeks I went in for my 1st appointment. I told the doctor how bad I was feeling but he didn't seem concerned until he started the ultrasound. I immediately knew something was wrong when I didn't see anything that looked like a fetus on the small screen. I looked at Ricardo and I could tell he felt the same way. The doctor tried doing a vaginal ultrasound and he still had no success at finding a fetus or a heartbeat. I was so confused, there has to be a baby, I am very pregnant! He told us that he suspected a possible molar pregnancy and this was confirmed about 15 minutes later when I went to radiology for another ultrasound. They told me that I had what is called a complete molar pregnancy and that I had to come back the next morning for a D&C. We were devastated. Neither of us could hold back the tears and how would I explain this to my daughter who was begging for a sibling? That night was terrible. I laid in bed knowing that all of the uncomfortable feelings I felt were not from a baby but instead from an abnormal growth that was rapidly growing in my uterus due to sperm trying to fertilize an egg with no genetic information. I never heard of a molar pregnancy before and this was all too much for me. I was also told that this tissue could turn into cancer. I was so ready to get this thing out of my body, I could not wait to have the D&C. The D&C was finally over and I woke up feeling so weak. My doctor told us that I lost a lot of blood and if I could not get up and walk on my own they would consider a blood transfusion. With my man by my side I got the strength to get up and walk, I was sent home soon after that. I stayed home from work for a couple of days and I prayed things would be back to normal soon. I went to the lab for weekly blood draws that were going great until a few weeks later my HCG levels began to rise. After 2-3 weeks of them rising I had to start a mild form of chemotherapy because the molar pregnancy did indeed turn cancerous. I hated every minute of the weekly injections but I was blessed to keep a full head of hair and I did not get sick very often. After 9 weeks of chemotherapy I was told that everything was going great and the chemo was over. The doctor made it very clear that we had to wait a year before trying to conceive again. At the time this felt like torture but as I look back now I understand that everything happens for a reason, and we needed that extra time. We are now married and in no rush to try again, I have decided to focus on school instead. I want to be a NICU nurse, and he is working on his dreams of opening up a barber shop. What doesn't kill you definitely makes you stronger.